BEAVER CREEK, Colo. (AP) — Swiss racer Beat Feuz has no doubt why he wound up on top — the downhill race was moved from the top. Given the weather conditions, organizers elected to start the race from a reserve spot lower on the hill. Feuz found the ideal line through difficult conditions to win a World Cup downhill race Friday. He finished in a time of 1 minute, 13.59 seconds to hold off teammate Mauro Caviezel by 0.07 seconds. Aksel Lund Svindal of Norway wound up third, 0.08 seconds back, as his reign came to an end. Svindal captured the last two downhill races at Beaver Creek before Feuz’s speedy performance on softening snow. Last season, when the course was running at full length, it was Svindal who edged Feuz by 0.15 seconds. The approximately 30-second portion of the course removed was a gliding section. That’s why Feuz didn’t mind the switch. The changing weather made it difficult for everyone. Racers had to deal with falling snow, inconsistent light and fog — sometimes all three — on their way through the demanding Birds of Prey course. There were several big crashes, including one by Thomas Dressen of Germany where he caught an edge and tumbled into the protective fence. Dressen hurt his knee and went to the hospital as a precaution. The fifth racer to take the course, Svindal was convinced he wouldn’t end up on the podium by the day’s end. Even more so when two racers later Feuz knocked him from the top spot. But Svindal remained in the top three — bandaged left thumb and all. He hurt it in a recent training crash and can’t hold his ski pole. So he tapes it to his glove instead. He also can’t push out of the start gate. No matter, he skates out of it. To think, given all his injuries over the years, the 35-year-old Svindal wasn’t sure how much he had left. But he couldn’t bring himself to leave the slopes. Not yet. It’s a solid start to the season for the 31-year-old Feuz, who earned bronze in the Olympic downhill last winter in addition to winning the overall title last season in the discipline. He was sixth in the opening downhill of the season last weekend in Lake Louise, Alberta. For Caviezel, this was his first podium finish in a World Cup downhill event. He had two others in the super-G.
With downhill training canceled Thursday, Caviezel was asked if he had a chance to squeeze in some powder skiing. 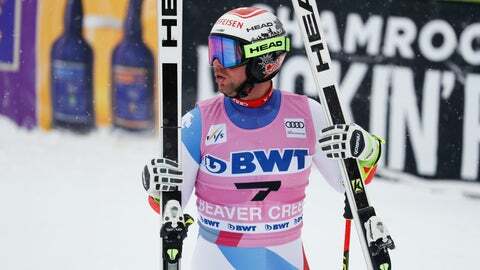 American teammates Steven Nyman and Bryce Bennett tied for ninth. Nyman is steadily rounding back into form after knee surgery that caused him to miss the Pyeongchang Olympics. The next race at Beaver Creek will be a super-G on Saturday — weather permitting. Vincent Kriechmayr of Austria is the defending champion.